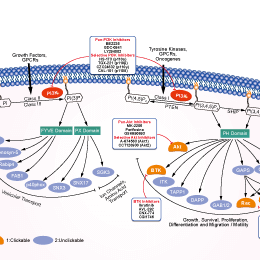 CH5132799 inhibits class I PI3Ks, particularly PI3Kα with IC50 of 14 nM; less potent to PI3Kβδγ, while sensitive in PIK3CA mutations cell lines. Phase 1. Effect of selected compounds on MLC phosphorylation induced by 2-AG. Washed platelets (1.0 x 109 platelets/mL) were preincubated at 37 ℃ for 10 min with saline or 20 uM LY294002 (L), 10 uM CH5132799 (C), 10 uM TGX221 (T), 10 uM MK2206 (M), 20 uM Y27632 (Y), 1 uM PIK-75 (P), 1 U/mL apyrase (AP), 5 uM AS252424 (AS), 1 uM IC87114 (IC) and then stimulated for 30 s with 10 uM 2-AG. At the end of incubation suitable aliquots were immunoblotted with anti-p-MLC (thr18/ser19) as detailed in Methods. Blot is representative of four independent experiments. Biochimie 2014 105, 182-91. CH5132799 purchased from Selleck. A549 cell was trypsinized and plated at 50% confluence in DMEM. 16 hours later, CH5132799 was added at final concentrations of 0, 1, 5, 10 and 20uM. Another 24 hours later, cells were harvested in RIPA with protease and phosphatase inhibitor cocktail. Total protein concentration was measured by BCA method. Lysates equivalent to 20ug total protein were subject to Western Blot, using total- AKT, pS473-AKT and beta-actin (internal control) antibodies. The E542K, E545K, and H1047R mutants of PI3Kα are prepared with an overlapped extension-polymerase chain reaction. Glutathione S-transferase-tagged PI3Kα mutants and His-tagged p85α are co-expressed with BAC-TO-BAC Baculovirus Expression System. 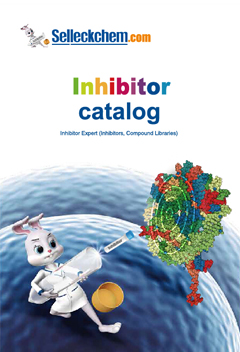 The inhibitory activities of CH5132799 on PI3Kα (p110α/p85α), PI3Kβ(p110β/p85α), PI3Kδ (p110δ/p85α), PI3Kγ (p110γ), PI3KC2α, PI3KC2β, Vps34, and PI3Kα mutants are determined by Adapta Universal Kinase Assay Kit. Time-resolved fluorescence is measured with an EnVision HTS microplate reader. IC50 values are calculated using XLfit. The cell lines are added to the wells of 96-well plates containing 0.076 to 10,000 nM CH5132799 and incubated at 37 °C. After 4 days of incubation, Cell Counting Kit-8 solution is added and, after incubation for several more hours, absorbance at 450 nm is measured with Microplate-Reader iMark. The antiproliferative activity is calculated by the formula (1- T/C) × 100 (%), in which T and C represent absorbance at 450 nm of the cells treated with CH5132799 (T) and that of untreated control cells (C). The IC50 values are calculated by using Microsoft Excel 2007. Animal Models: A total of 4 × 106 to 1.2 × 107 cells are injected subcutaneously into the right flank of female BALB-nu/nu mice. Formulation: CH5132799 is dissolved in DMSO. Administration: Orally administered once a day. Tanaka H, et al, Clin Cancer Res, 2011, 17(10), 3272-3281. Ohwada J, et al, Bioorg Med Chem Leff, 2011, 21(6), 1767-1772.